St. Malo is a walled city port in Brittany. Historically it was notorious for piracy, being home to the infamous ‘Corsairs’ – privateers who roamed the English Channel forcing ships to pay tribute. Wealth also came from further afield; Jacques Cartier is credited with discovering Canada and sailors from St. Malo were the first to colonise the Falkland Islands (hence ‘Malvinas’ or ‘Malouines’) and to successfully navigate Cape Horn. The best places to stay in St. Malo enable the traveller to soak in this dashing past which is reflected in the beaches, buildings and ramparts of the town. Today St. Malo is a major tourist destination. The population of 150,000 can swell to 200,000 during the season. There is much to see and do. The town has one of the highest concentrations of restaurants in Europe and oysters are a particular speciality. According to one travel writer ‘the dense labyrinth of dressed stone speaks of the power, wealth and shamelessness of the 17th and 18th centuries’. There are innumerable sites of interest; the walled city, the Solidor Tower, the tomb of Chateaubriand, the Cathedral of St. Vincent, the great Aquarium - the list goes on. Take a walk along St. Malo's historic walls that surround the whole of the Old Town. Stroll through the cobblestone streets of the pretty Old Town stopping at cafes and restaurants along the way. Enjoy blustery walks along the long stretch of Plage du Sillon. Explore the Château de Saint-Malo dating back to the 1400s. The best places to stay in St Malo make a brilliant stop off point either on your way to discover more of France or on your way home.....though the town merits at least a couple of days stop over. 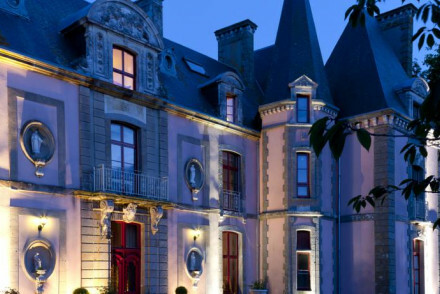 L’Ascott is a beautiful 18th century mansion situated in the Saint Servan district of St. Malo. It boasts a lovely secluded garden for enjoying drinks or breakfast and the central location provides an ideal base for exploring the town and surrounding area. Malouiniere Le Valmarin is a former ship owner's residence dating from the 18th century and is set in a wooded park 50m from the beach. It has 12 spacious bedrooms and exudes warmth, comfort and refinement. Chateau du Colombier is a lovely castle with beautiful architecture that dates back to 1715 built by a ship manager of the East India Company. High ceilings, four poster beds, period furniture and intricate chandeliers add to the old world charm. 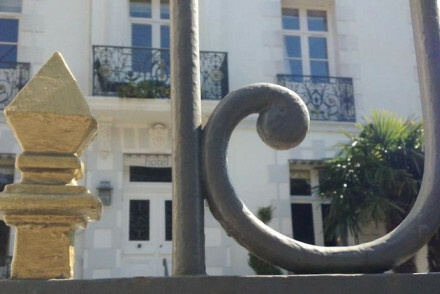 This attractive mansion, Hotel La Villefromoy, is elegantly decorated and features smart, spacious rooms. It's located only a minute away from the beach and just a short walk from the walled city of Saint Malo. 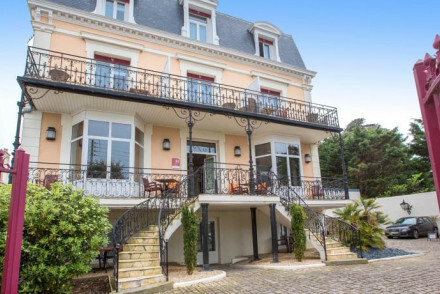 Directly on the Saint-Malo seafront, Les Charmettes is a charming hotel. Rooms are comfortable and smart and many have glorious seaside views. The Beaufort enjoys a prime position on the seafront near the centre of St.Malo. The contemporary guestrooms of the hotel showcase breathtaking water views and all from only €79 per night! The Auberge de la Motte Jean (Nr. Cancale) is set in a beautiful, typically French style garden. The hotel has a sophisticated atmosphere. It is a short walk from the beach. Easily one of the best places to stay if you're looking for a beach break. The Manoir de Rigurdaine lies on the Emerald coast and has panoramic views over the beautiful estuary towards St. Malo. The hotel is full of character with hundred year old beams, open fires and a billiard room. The Hotel Printania is also on the seafront looking over the river Rance to St. Malo. 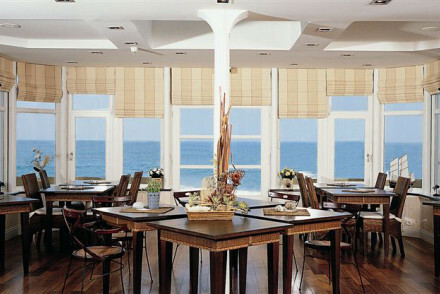 This restaurant with rooms offers gourmet cuisine and a relaxed vibe all accompanied by fabulous views! It's great value too. Fly to Dinard-Pleurtuit-St-Malo Airport, 13 km from the city or travel by train to St. Malo's station which is well connected to Paris and Rennes. Weather-wise the best time to visit is the summer months from June to September with temperatures peaking in August around the mid twenties celcius. Browse our list of the best places to stay in St Malo. Alternatively check out all ourrecommendations in Brittany for further inspiration. Or call or email one of our friendly gurus for some advice. Directly on the Saint-Malo seafront, Les Charmettes is a charming hotel. Rooms are comfortable and smart and many have glorious seaside views. Spend the day relaxing on the beach and in the evening enjoy delicious regional seafood, especially the world famous Sillon oysters. Surfing - Saint-Malo's strong spring and autumn tides make it a great place for surfing. Sailing - Perfect stopping point for a sailing trip around the coast of Brittany. Sights nearby - Visit the famous 12th centrury Saint-Malo ramparts. Seafront townhouse hotel in St Malo. Contemporary rooms with private sea facing balconies and all the modern gadgetry. A lovely lounge bar with a terrace for watching the sun go down. 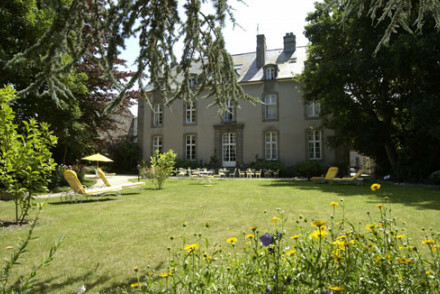 An elegant hotel with the feel of a country manor yet in the centre of St Malo. Graceful toile de jouy dressed bedrooms and family suites. Beautiful garden, neighbouring beaches, spas, restaurants, and watersports. A great choice for families and those on a budget. An excellent characterful three-star hotel in a glorious position. Beautiful stone farmhouse with simple airy bedrooms, private terraces, Persian rugs, bright colours and antiques. A lofty beamed breakfast room serves delicious French cuisine. Ideally situated for access to the Emerald Coast. Country Escape - An old country estate with views of the Brittany estuary and rolling hillside plus cosy converted bar/barn. 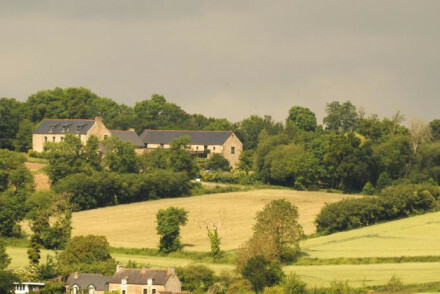 Great walks - There are many hiking trails running through the surrounding countryside, ask your host for details. Local markets - There are a number of local markets open throughout the week, at Dinan, Dinard and St Malo. Fishing - The hotel gives guests access to their private fishing area, but bring your own rods! 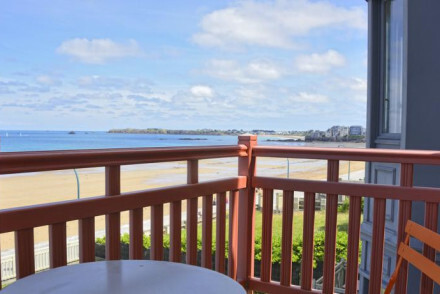 A charming little hotel in Saint-Malo within easy reach of lovely beaches. Contemporary chic rooms in muted tones with parquet floors, luxury bedding, and all the mod cons. A really pleasant spot for a weekend break near the beach. Views - The Bay of St Malo is beautiful. Sights nearby - Explore the neighbourhoods of Solido, Intra Muros. A lovely castle with beautiful architecture that dates back to 1715 built by a ship manager of the East India Company. High ceilings, four poster beds, period furniture and intricate chandeliers add to the old world charm. A fine dining restaurant with wonderful views of the lush gardens. Local exploring - In a splendid quiet location, close to the city centre, yet moments away from the beautiful beaches in the Brittany region. Writing a novel - Sit out in the lovely gardens and be inspired by the poetic location and peaceful atmosphere. Sights nearby - Check out the Saint-Malo Cathedral and the 18th century La Demeure de Corsaire - a privateers house and museum. Local markets - Walk and explore the interesting cobbled streets of the old town. This attractive mansion is elegantly decorated and features smart, spacious rooms. It's located only a minute away from the beach and just a short walk away from the walled city of Saint Malo. Energy from pancakes & fresh bread for breakfast will have you bicycling along the promenade in no time! Beach Life - The hotel sits just a minute away from the beautiful Rochebonne beach!